As well as offering you the cheapest OSRS Runescape Gold online. 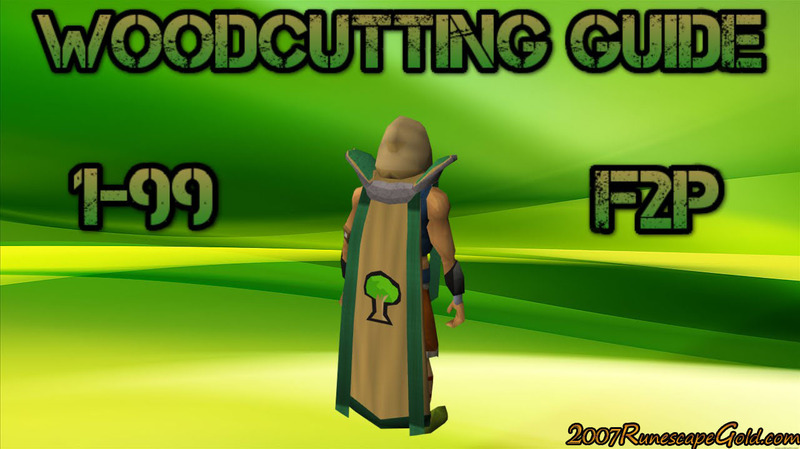 We also like to help you in the game as well and that is what we are doing today with this Woodcutting guide. If you wear the Lumberjack Outfit while you are woodcutting you get a 2.5xp bonus. So if you have it, wear it! Level 1-15: Trees!!! From 1 to 15 all you do is cut trees, they are everywhere! Level 15-30: Oak trees are what you will want to be cutting here and they are everywhere as well. Level 30-60: Willow trees, just south of Draynor Village there is a nice little area that has a good amount of willow trees for you to cut down. Level 60-65: Maple logs, Before you start dealing with maple logs, you might want to consider entering the woodcutting guild for the 50k XP per hour it can get you. If you do not want to deal with the guild Behind Seers Village Bank there are some you can get. Level 65-90: Teak trees, Ape Attol is the best place in the game to get to these, but it does mean you will have to have done at least Monkey Madness 1. Level 90-99: Redwood trees, these can be very AFK and offer incredible Woodcutting XP, but you do need to be in the Woodcutting guild to be able to chop these. Woodcutting could not be any easier. Of course, if you want to make some money while doing this then you will have to chop things like magic trees, which you can do if you are in the guild. Thanks for reading and make sure your OSRS bank balance is healthy by checking out our awesomely priced, Old School Runescape Gold.